The Federal Reserve is tapping the brakes on the U.S. economy just as it's starting to pick up some momentum. Critics fear that even a gentle tap could thrust the economy back into recession. But Fed chief Janet Yellen strongly defended the decision. "We don't want to cause a recession," Yellen said in a press conference Wednesday after the central bank announced raising its key interest rate for the first time in nearly a decade. The move was a signal from the Fed that it believes the U.S. economy is strong now and no longer needs crutches. However, it is also widely expected that more interest rate increases are coming in the future. If the Fed raises rates by too much or too quickly, the fear is that it could put the economy back in recession. Memories are fresh of the period between 2004 and 2006 when the Fed raised rates 17 times in a row after barely moving in the previous years even as the housing bubble ballooned. That torrid pace of rate increases didn't help the economy as it headed into the Great Recession, experts say. 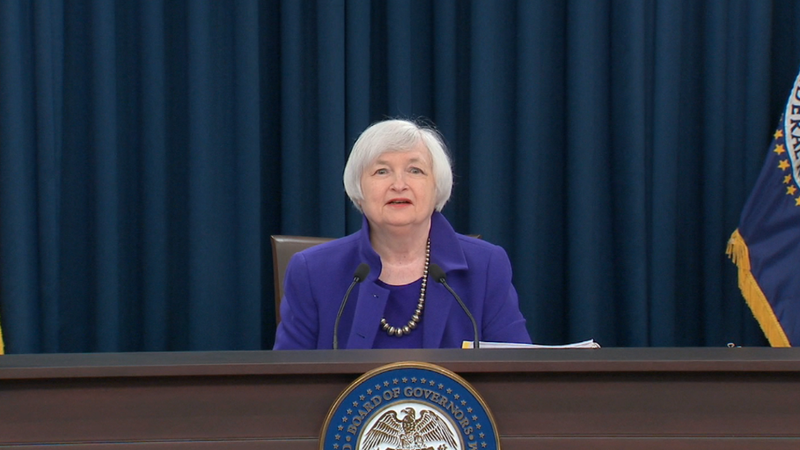 Yellen acknowledged that fear Wednesday but said: "I don't believe we'll have to do it." Indeed, the economy has made a lot of progress. The U.S. has added 12 million jobs since the recession ended in June 2009. Unemployment is 5% now, down from 10% in 2009 and last year was the best year of job growth since 1999. The conditions were ripe for the Fed to raise rates. The current economic recovery has lasted for 76 months. It's not the longest recovery ever -- there were 120 straight months of growth between March 1991 and March 2001. But it's better than the average of about five years, or 60 months, since World War II, according to Morgan Stanley. Some say recoveries simply die of old age and that there's no need to put the brakes on it. But Yellen dismissed the notion that just because the economy has expanded for so long, its days are numbered. "It's a myth that expansions die of old age," Yellen said. Yellen argued Wednesday that the Fed is raising rates at the right time so that it can move gradually and not shock the economy. Her statement is especially important since the U.S. recovery has been been slow, tepid and fragile. Fed critics fear even a few rates hikes will end the economy's momentum. When rates go up, it increases the cost of borrowing money for all types of businesses. Those increases, even small ones, can make the economy simmer down. Despite the economic expansion, it was a tough decision -- American manufacturers are getting crushed now by the strong U.S. dollar and weak global economy. So why is the Fed raising rates? It doesn't want to let the job market get too hot, which often sparks inflation. If inflation rises faster than expected, the Fed has to raise rates even quicker than it planned -- something that would spark volatility in stocks and bonds across the globe. That volatility could in turn worsen the global economy, which would hurt the U.S. economy even more. "It's a delicate balancing act," says Gus Faucher, senior economist at PNC Financial. "If they didn't act now and inflation rose more quickly, they would have to act more aggressively down the road."